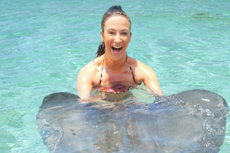 Encounter one of Cozumel's most popular marine animals is the stingray. Interact, feed and touch the stingrays as you swim side by side with them in this unforgettable experience. Excellent, fun tour. Guides were knowledgeable and personable and fun. Small group, easy transportation. Stingrays were beautiful creatures and we really enjoyed this. Stingray beach was awesome, the had some huge rays, art nice facility and great people. my five year old did this at xcaret and LOVED it. my five year old did this at xcaret and LOVED it. so awesome. was his favorite part of the trip. This was so lame, I don&apos;t know where to begin. Everyone Loves Rays and Sharks. Everyone Loves Rays and Sharks. Would of been better had we known you can&apos;t take pictures. You have to pay another $80USD for the staff to take your picture. Everything about Stingray Beach was wonderful. Taxi picked us up took us to the location about 10 mins from port. It was Great. It was call "Everyone love Rays". Excellent adventure for the price! Excellent adventure for the price! Staff was very friendly and attentive. One of the highlights of the trip! Cozumel itself is probably the best destination on this cruise to shop and explore on your own. Amazing day. Got to hold and feed the Rays. A lot of fun, worth the money for us. Thoroughly enjoyed our day with the stingrays, feed them, played with them, snorkeled and just generally had a great time. Experience in the shallow area was limited to touching/holding rays and dodging large waves. Fantastic! Got to touch some stingrays, snorkel with about 40 of them and some beautiful coral arrangements, an excellent excursion. It was a good encounter although the groups were a little large causing a lot of down time although over all it was a good encounter. Wasn&apos;t my idea to swim with the fishes..was my wifes idea. The guides were great! The stingrays were fascinating. Swimming with them was terrific! Great informative experience with the stingrays. Great informative experience with the stingrays. they take pictures then you buy the CD for a nominal cost. Fenced in area right on shore.